I will meditate on Your precepts and fix my eyes on Your ways. I will delight in Your statutes; I will not forget Your word. The longest chapter in the Bible is Psalm 119. It hosts 176 verses. It sits in the very middle of the Bible. And, the whole of it is about one subject: the unique, unparalleled importance of the Word of God. An apologetic for the Book itself. Yep, it’s long. But, it is well worth reading all the way through. Believe it or not, it was actually written to be memorized. Each of the 22 sections (8 verses each) starts with a successive letter of the Hebrew alphabet (i.e., “A” starts the first line of Psalm 119:1, “B” stars the first line of Psalm 119:9, and so on). So the question arises. Why would anyone memorize these 22 sections of 8 verses? Answer—to never forget ALL the benefits of knowing God, hearing God, following God, gaining instruction from God, having a heart, mind, will shaped by God ARE TO BE HAD through attention to the Word of God. To never neglect pursuing all God has for us from Himself in His Word. “All Scripture is breathed out by God,” Paul reminded Timothy, “and thus it is profitable…” (2 Timothy 3:16). The verses above are just a sample of the Psalm’s feast. But notice it is not a Book we are out to know. It’s a Person. Eight times in 4 verses, it’s about “You” or “Your” (i.e., God). This is not an academic pursuit; this is a relationship journey. 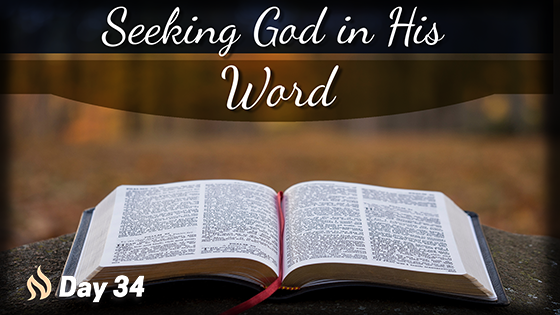 The Psalmist, like Paul, is saying, “I want to know Him.” To seek Him. To think like Him. To hate sin like Him. To live in His ways and delight His heart. Wow! What an incredible opportunity when the Word of my God renews the center of my heart.